There are three video game series that are currently MIA. You probably know them. F-Zero hasn’t had a new installment since 2004. Star Fox hasn’t had a new installment since 2006. 1)A remake of Star Fox 64 was released for Nintendo 3DS in 2011 and a new title is currently in development for Wii U. And Metroid hasn’t has a new installment since 2010—2007 if we choose to discount Metroid: Other M. We’re here to talk about Metroid today. Of those three series I mentioned, Metroid has the longest history, dating back to the original Metroid on the NES in 1986. If you’d like to keep track, the series will turn 30 on August 6, 2016. That game made some significant waves by revealing at the end that Samus Aran, the player character, is a woman. 2)The ending only revealed Samus’s identity if the game was completed quickly enough. It was one of the first games to feature a female protagonist and definitely one of the first where the female protagonist’s gender is irrelevant to the story. Hold that thought for a bit. I’ll also say that the material I’m talking about here is limited to the games alone—there are comics that supposedly expand on Samus’s backstory, but do so while conflicting with some pretty important plot points in the actual games. Furthermore, I’m choosing to discount Other M for a pair of reasons: I haven’t played it, and, from what I’ve read, it seems like an anomaly in the grander scale of Metroid games. The two games I’m focusing on are Super Metroid, released in 1994 for the Super NES, and Metroid Prime, developed by Retro Studios and released in 2002 for the GameCube. Though it’s a bit hard to believe now, there were precisely zero Metroid games released between those two games. 3)Metroid Fusion on the Game Boy Advance was released on the same day as Prime. Samus Aran made two appearances in Super Smash Bros. titles during that gap. I recently finished a replay of Metroid Prime via the Prime Trilogy that was released as a downloadable title for Wii U, but for simplicity’s sake I’m working with the GCN edition. I’m currently in the middle of my first-ever playthrough of Super Metroid using the Wii U’s Virtual Console service. It’s fascinating how similar these two titles are, especially considering Prime was handled by a different developer entirely. What both games absolutely nail is the balance between the feeling of isolation and an enjoyable gaming experience. The glut of zombie and/or post-apocalyptic games that have been flooding the market for years often go all-in on the former at the expense of the latter. In all honesty, it’s a pretty simple task to create a sense of isolation for the player. It’s a significant part of any survival horror game and even a few action games. You can go for hours without even seeing an NPC to talk to in games like Fallout 3, though you do have the option of recruiting a traveling companion. That’s something a lot of those games do to, in a way, subvert the isolation. Two examples that come to mind are Resident Evil 4 (Ashley) and The Last of Us (Ellie). It’s executed pretty well in the latter title, as the banter between protagonist Joel and Ellie served to lighten the mood in times where riding solo would have been nervewracking. It made the game fun and easy to play for long periods. But trekking through the Bethesda Fallout titles can get real boring real fast with no one to talk to, even if they accurately portray that feeling of loneliness. And then you have these two Metroid games, in which you are Samus and only Samus for the entire duration of both. Super Metroid has a bit of a monologue from Samus at the start of the game to set the scene, but Metroid Prime doesn’t contain a single word of dialogue at all. None! You’re the only human you ever see. The Space Pirates you encounter care too much about killing you to bother with stopping to talk. There’s never a Shakespearean moment where Samus feels the need to recap whatever may have just happened for the benefit of the player. There’s never a need to speak–so she doesn’t. You are isolated. But the games themselves are still exciting, not only because of the ability to explore, but what you’re exploring. This is particularly true in Prime, where the environments squeeze every last bit of processing power and graphical prowess out of that tiny little Cube. 2002 wasn’t exactly a time where HD was the norm, but exploring the crumbling Chozo Ruins and the icy Phendrana Drifts sure made it feel like it. Prime had a lot of small graphical touches that made it clear Retro Studios was handling the franchise with respect. Once you emerge from the water, the leftover droplets take a few seconds to roll off your visor. Walking through steamy areas fogs your vision. Energetic explosions offer you brief glimpses of Samus’s reflection in her own visor. You can even see Samus’s own bones whenever you peer through her X-Ray Visor. That’s not to say Super Metroid wasn’t equally impressive for 1994. The X-Ray Visor obtainable in that game functions differently—it’s used to determine whether walls are breakable (by displaying the weapon icon that can be used to break them) or transparent. But there’s so much attention to detail in that game where running into a dead end is just an excuse to use the scanner so you can see that small hole the Morph Ball can fit into. Elements like that give these two games the sense of exploration that makes them so enticing to come back to. I was barely able to put Metroid Prime down despite having played through it long ago and I’m feeling the same way about Super Metroid right now. People don’t often find criticisms with Metroid games, but a common one is a perceived overreliance on “backtracking.” What is backtracking? I know what backtracking is; rather, I know what people see it as. Badly-designed games suffer from it in many ways. As a means of arbitrarily lengthening gameplay, sequences are inserted into the game where you have to return to a previously reached point in order to advance the story. A few of the later Zelda games are victims of this, but on a smaller scale since at least (in most cases) they’re still entertaining. It never feels tedious in the world of Metroid. I’m always excited to keep exploring, because each time I get something new I want to try it out. The game rewards you for it, too. Shortcuts, upgrades, expansions, all of these are often only found upon very close examination with something you may not have had earlier in the game. Metroid Prime adds a further dimension to it with the scanning system, a mechanic not present in any of the prior Metroid games. Available from the start of the game, you can enable Samus’s Scan Visor, which will highlight things you may scan in your immediate radius with an orange or red (signifying something important) icon. Orange icons often provide minor context, such as computer screens. The red icons can unlock doors and signify that something is a breakable material (like the X-Ray Visor in Super Metroid), but their main function is to fill out Samus’s Logbook. Many of the game mechanics fall into this category, such as the health/ammunition pickups Samus can collect as well as save stations, Samus’s gunship, and so on. Every enemy you face falls into this category, including bosses. Chozo Lore. Messages on the walls of the Chozo Ruins region fall into this category. The entires flesh out what happened on Tallon IV before Samus’s arrival and even contain a few prophetic references to her. Pirate Data. Computer terminals across Tallon IV fill this category. They detail the circumstances of the Pirates’ arrival/research and, later, their consternation with Samus Aran, including one hilarious log where they try to duplicate Morph Ball tech. The twelve Chozo Artifacts necessary to complete the game fall into this category–sort of. What actually fills the log are the hints for each one which can all be scanned at the same place. The Logbook is, essentially, the source of the story for the game. With no dialogue, it’s up to the player to piece together the bits and parts in order to determine the whats, whens, and whys. Of course, it’s entirely optional. But it’s all there for the taking. You’re free to blaze through the game, shoot everything in sight, and not give one hoot about why you need to do it. You’re just as free to walk through the game, scan everything in sight, and figure out just what the hell happened to Tallon IV. Any option in between is just as possible—a level of freedom not achievable were you to just select Story On or Story Off at the start of the game. Everything, really, is up to the player. That’s what keeps the isolation from being overwhelming. You are your own company, and you’re pretty good company. Exploring every nook and cranny, trying to see if there’s a new shortcut to hit, everything is your choice and your choice alone. Samus Aran is a capable bounty hunter with a wealth of tools at her disposal; it only makes sense that’s it’s fun as hell to play as her. It’s never unrealistic or surprising that Samus Aran is a woman. She is never obligated to prove herself to anyone. It’s the logical endgame of progressive video game writing, something I talked about in my review for Transistor. It’s not tokenism. It’s not exploitative. It’s just perfectly natural within the context of the game. Like I said, the Space Pirates don’t seethe about being beaten by a girl. They seethe about getting beaten, period. That’s realistic. For nearly 30 years, Samus Aran has been the only female “mascot” for a flagship Nintendo series. 4)Though Zelda’s name is in the title of the games, it’s undeniable that the most recognizable character is always Link, to the point where many mistakenly refer to him as Zelda. For this reason, it’s particularly disappointing that there hasn’t been a new entry in her series since Other M. But as stated earlier, the wait between Super Metroid and Metroid Prime was eight years. So waiting can often be worth it. The question is, though: who’s going to make the next Metroid? Retro Studios handled the Prime trilogy, moving to work on the Donkey Kong Country Returns franchise once their work with Prime wrapped up. Team Ninja (of, ahem, the Dead or Alive games) worked on Other M. It’s arguable that Retro is batting 1.000 with the critical and commercial successes of both the Prime trilogy as well as the Donkey Kong Country Returns games. As of now, they’re currently working on an undisclosed Wii U title which will likely be revealed in a month at E3. Here’s hoping we get to see the return of Samus Aran—it’s been too long already. 1. ↑ A remake of Star Fox 64 was released for Nintendo 3DS in 2011 and a new title is currently in development for Wii U. 2. ↑ The ending only revealed Samus’s identity if the game was completed quickly enough. 3. ↑ Metroid Fusion on the Game Boy Advance was released on the same day as Prime. 4. ↑ Though Zelda’s name is in the title of the games, it’s undeniable that the most recognizable character is always Link, to the point where many mistakenly refer to him as Zelda. Super Mario. The Legend of Zelda. Pokémon. Fire Emblem. 1. ↑ It began way back in 1990. So, maybe the Official Game Losers 2014-15 NFL Playoffs Madden NFL 2001 Simulation didn’t exactly pan out. For one, the Super Bowl (one week from this Sunday) will be a contest between the Seattle Seahawks and the New England Patriots. Both were #1 seeds in this year’s playoffs—in other words, this was easily the most predictable outcome ever. Both were also left out of the 2014-15 playoffs in the Simulation. In fact, it would have been completely impossible for the Simulation to have predicted this outcome. If you’ll remember correctly, before the divisional realignment in 2002 the Seattle Seahawks were still in the AFC. In other words, one million Simulations could have been ran using the outdated Madden NFL 2001 and not a single one of them could possibly have had the AFC representative Patriots meeting the now-NFC representative Seahawks. Oops. For what it’s worth (nothing), the Simulation did manage to hit a couple of things correctly. The Ravens went on the road and beat the Steelers both in the Simulation and in real life. The Colts made it to the AFC Championship both in the Simulation and in real life. 1)However, they hosted it in the Simulation and won. Otherwise, it was pretty much a wash. A simulation where the home team won every game would have been far more accurate and would have nailed the Super Bowl. This surprises no one but me. I would have thought the cosmic radiation of a plan so asinine would have come full circle, but nope. Turns out it’s a bad idea to try to use a video game that’s fifteen years old to predict today’s events. 1. ↑ However, they hosted it in the Simulation and won. 2. ↑ I do not count the Pro Bowl. 3. ↑ I had to fit at least one reference in here. 1. ↑ Madden failed to predict the Giants upsetting the Patriots in 2008, the Packers beating the Steelers in 2011, and last year’s Seahawks beating the Broncos. Sports games have come a mighty long way since the 90s. Editor-in-Chief Roger Burton can tell you that much—he knows way more about the major sports game franchises than I could ever dream to learn (or want to learn, but that’s another story). 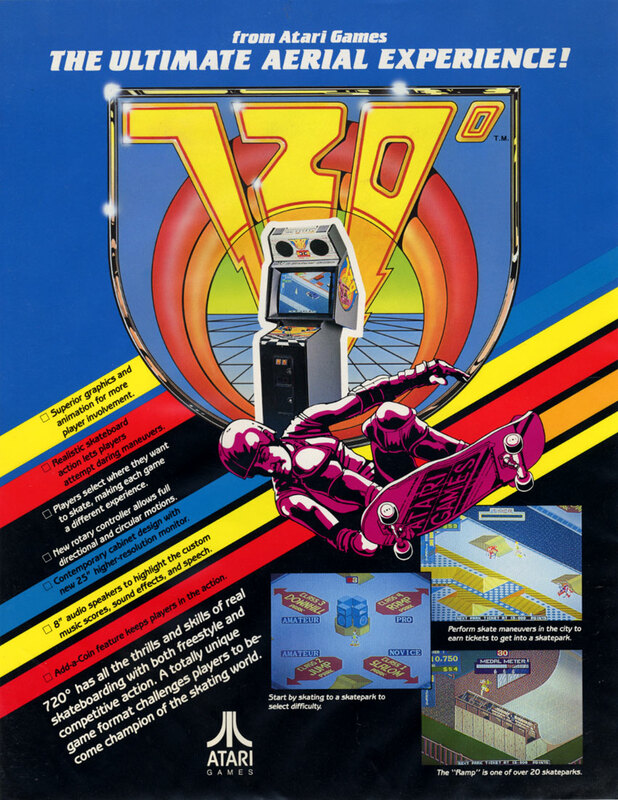 So I was pretty surprised when we were talking about NES games and he’d never heard of 720°. I mean, really? How do you know so much about sports and games and everything in between but not this? Come on, Burton, step it up. So anyway, now that I’ve proven that I actually know a sports game thing that Roger doesn’t know, I want to share with you all a little bit about this game. And, of course, why it terrified me as a kid. So, what horrors lurk beyond this gnarly facade? Well…admittedly, not that many, but I still feel weird whenever I think about this game.